Three of Belize’s most highly regarded resorts have come together to form Unique Hotels of Belize; an exclusive collection “dedicated to offering consistently high standards in accommodations, amenities and service” in three locations across Belize, according to UHB member The Lodge at Chaa Creek. 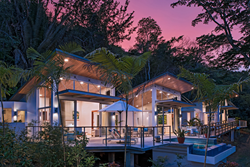 And, to introduce Unique Hotels of Belize, the group is offering a twenty per cent discount off a new all-inclusive Belize vacation package that gives travellers a unique opportunity to experience Belize’s inland jungles, Caribbean islands and Belizean coast in seamless luxury, with three nights at each member resort, Chaa Creek’s managing director Bryony Fleming Bradley said. Ms Bradley explained that Unique Hotels of Belize brings together the award-winning jungle lodge Chaa Creek, the landmark Victoria House on Ambergris Caye and Naïa Resort and Spa on the Placencia Peninsula. Together, they offer travellers a unique blend of individual styles and distinctive locations combined with a shared commitment towards providing the highest quality accommodations, amenities and service in Belize. “Unique Hotels of Belize was designed to give visitors confidence that, whether in the rainforests of Belize’s ancient Maya heartland, the Belize Great Barrier Reef, or on the Caribbean coast, they’ll enjoy the same high standards of excellence in Belizean hospitality. “Under the Unique Hotels of Belize brand we’re retaining our own distinctive identities and highlighting our diverse locations while giving travellers the confidence that they’ll enjoy consistent high standards of hospitality whenever they stay at a UHB member resort. “By combining our infrastructures and network of travel professionals both locally and internationally, we’re able to offer seamless transfers between our properties along with surprisingly affordable Belize vacation packages,” Ms Bradley said. The all-inclusive introductory vacation package was further discounted to give more families, couples and individuals a chance to experience Belize’s three most popular locations with unprecedented ease and luxury, she explained. “With twenty-per cent off this introductory vacation package, we’ve hoping to introduce more and more people to Belize’s amazing geographic and cultural diversity in a way that really hasn’t been possible before now. “And with luxury, service and a range of activities that will make it truly memorable, we’re expecting to create a buzz,” she said. The travel industry is already beginning to take notice. Ms Bradley said the nine nights all-inclusive Belize vacation package features three nights at each member resort with accommodations, all meals, activities and transfers included for one set price. “From the moment we pick our guests up at Belize’s international airport until we drop them back off, we look after everything. For example, moving from one resort to the next, to go from breakfast in a rainforest amid ancient Maya artefacts to swimming in clear Caribbean waters that afternoon, is seamless and carefree. And there are no hidden costs or credit cards surprises when they arrive home,” she said. Ms Bradley encouraged travellers to contact their travel agents, visit the Unique Hotels of Belize website, or contact Chaa Creek directly for further information or to make bookings. “It is an exciting launch for what we believe will become the gold standard of Belizean hospitality,” Ms Bradley said.